¿Por que no empezamos con...? "The restaurants that are created as personal projects by people who previously worked for top professionals, usually have an extra illusion that is reflected in the quality of the dishes and the service provided. 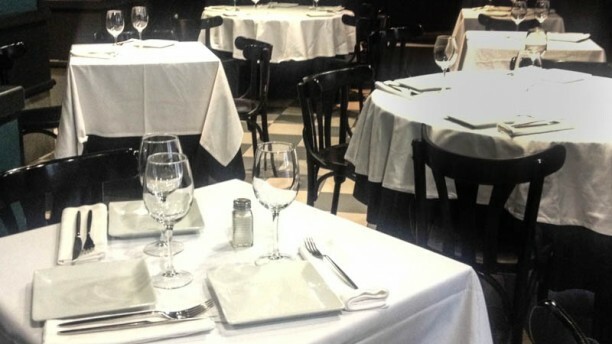 A clear example is the restaurant Tres Bocas, a landmark in the Argüelles neighborhood along with the Corte Inglés de Princesa. By the hand of Nico in the kitchen and Leo on the cocktails, you'll find an imaginative menu, where ingredients and quality product are played with, so you can taste different flavors. Eggplant hummus, crab cannelloni, Carrilleras ibéricas curry... are suggestions that you won't be able to miss. With seductive desserts (the creamy Cheese-cake of white chocolate and lime with coconut stands out), very affordable prices, an extensive bar that invites you to enjoy its elaborate cocktails, its private lounge and a pleasant inner courtyard, at Tres Bocas you will not find a restaurant, you'll find your restaurant." Excellent south american kitchen with a personal touch. Very nice place, you can stay for after dinner drinks. Carta de vinos corta y caros. When you walk in you don't first realize that there is a very nice dining area behind the bar. This is an excellent small restaurant serving very good food and you surely wish to return from time to time. The menu has several nice items you like to eat. They are all made of fresh ingredients and presented very well, and what is the best, the prices are really reasonable. Servicio excelente y ambiente agradable. I have been wanting to try this place for a while We decided to just share 3 starters rather than order a main course each. Food did not disappoint! The fish ceviche with grilled sweet potato on the house was great! There was no English menu but the waitress was more than happy to translate every item for us. We will come back again to try the main courses another time. A very enjoyable experience. Lovely food and attentive, professional staff. Very good value for money on tasty dishes. Totally recommend! Innovative dishes, tasty, great service, even though the menu only in Spanish it was explained, we had a great time! Great find! Delicious food and friendly staff. We had lunch in the restorant and both the food and service were perfect. Most of all we liked the startes: crockets and avocado cream. There was no English menu, but they spoke English very well and described all dishes. Thank you a lot for the food and service. Excellent entrees and house red, and helpful staff. The main dishes were good but could've come with vegetables or salad. Fantastic creme brûlée and cheesecake for dessert, but disappointing that neither cava nor Pedro Ximenez were available by the glass!